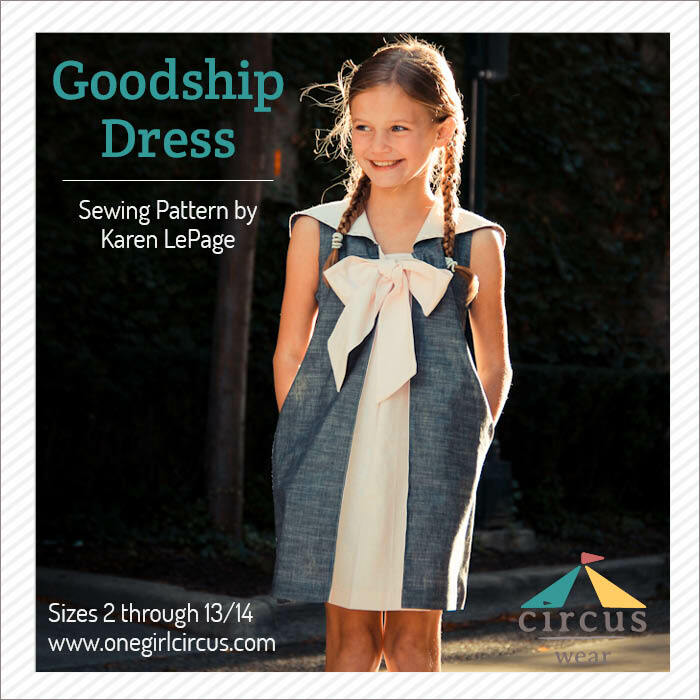 Now Available: The Goodship Dress PDF Sewing Pattern! It’s here, it’s here! 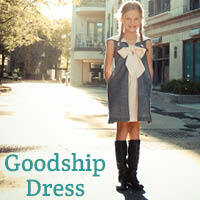 The Goodship Dress is here. 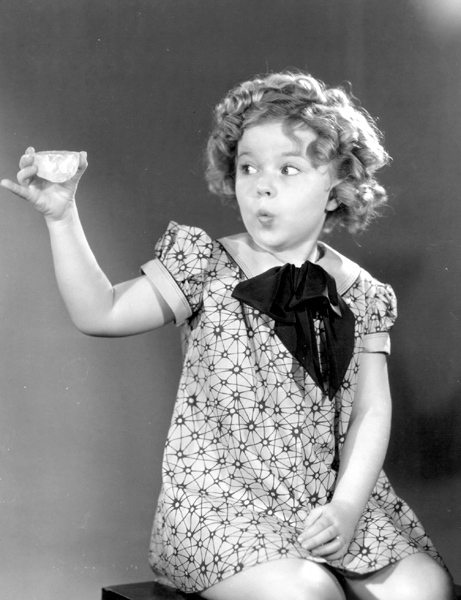 I love the enormous Bow on this dress, and the Sailor-y but not Costume-ish style. I knew going forward I wanted to create styles that foster a wide variety of variation and interpretation so you can really show your kid’s personality off in a way that suits her (or him – up next!). 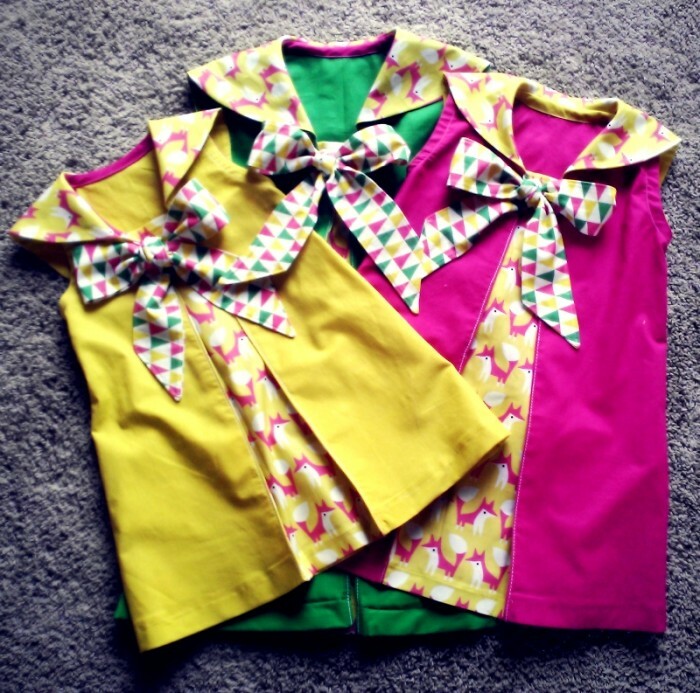 The styles I will release will be sized from toddler to tween with special details to make your handmade garments last. Those are the dresses on the bottom center. Naturally, I needed to make some of Rae’s Charlie Tunic on the bottom right. 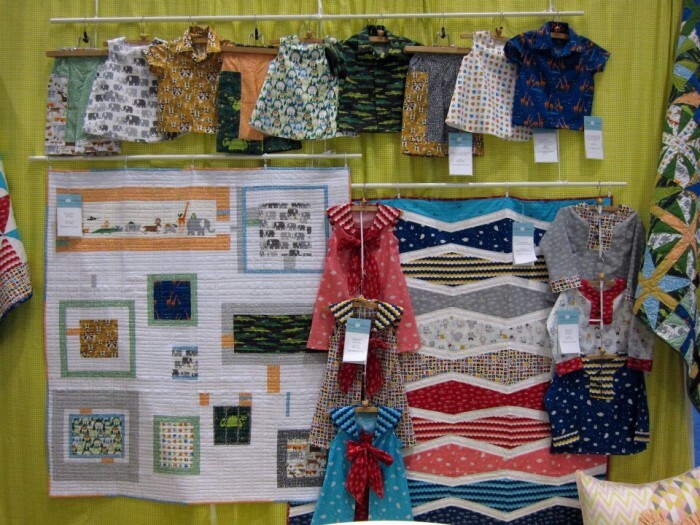 Lynn Harris made the vintage dresses up top, interspersed with shirts by Meagan Buch and oooooh a sneak peek of something else I’m working on, too. I went on to make more of the dress for Ella and her Cousins to have their pictures taken. 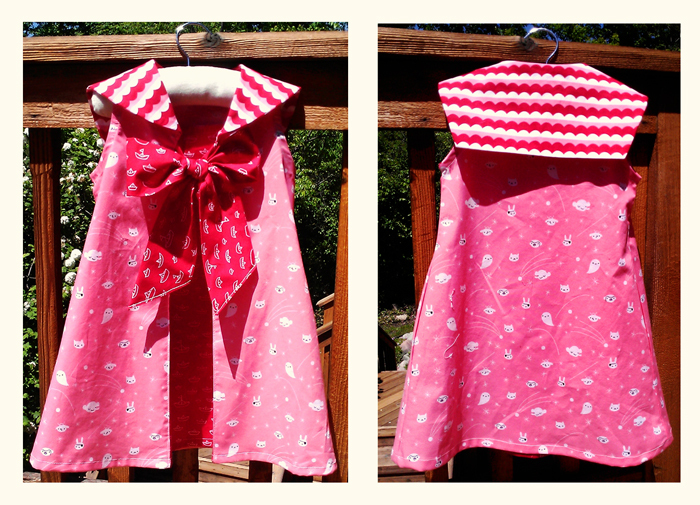 This time I used Kona cotton for the bright solids and Rae’s Spoonflower Fabrics for fun. 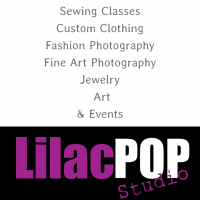 Forgive my photos in the beginning of the post here, but I want you to see the different looks you can create simply by choosing different fabrics. 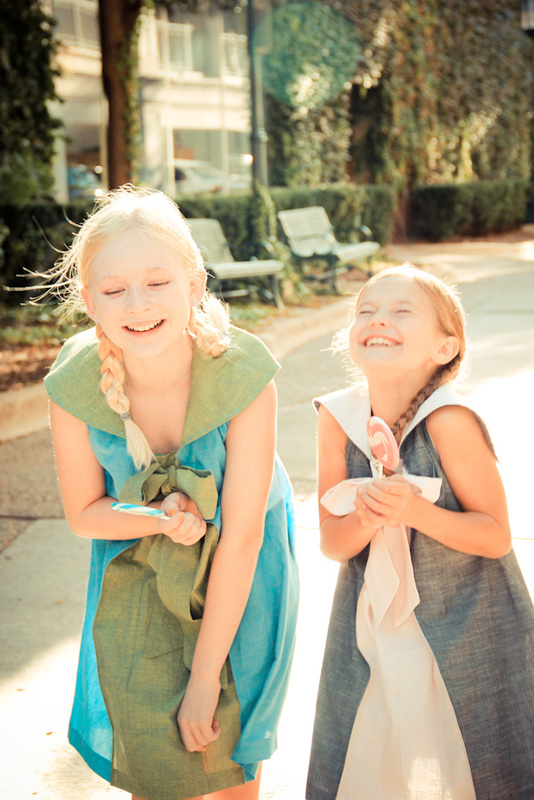 When you go to the Goodship Dress Page you will see some gorgeous photos by Janna Bissett . We took these in some pretty chilly weather, but Justina and Renate were such good sports. This pattern wouldn’t be what it is, were it not for some great feedback from testers. Thanks to Kristie of NIXO for making the first tab version, taking the dress into mod territory; others had asked for a different closure option so little kids can dress themselves. 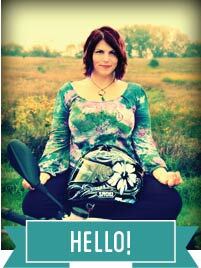 Please thank my fantastic testers by visiting their links: Kristy, Millie, Palak, Marleen, Michelle, Dyanna , Kelly, Charity, Sara, Andrea, …and the dear, darling, blogless Stephanie K.
Millie and Kelly have already posted reviews! You can have a look at the Goodship Dress Page for more technical information and to buy the pattern! p.s. If you want to spread the word, I’d be thrilled. 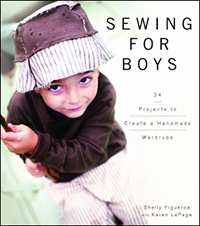 I cannot wait to see what you make! Oh thank you, Anneliese! I can’t wait to see how you make it up. I’m really enjoying exploring your site!